Lucky Cat Twosie Zip Bags. 20 Food-Safe Bags with Zipper top. 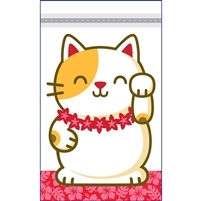 Lucky Cat, or Maneki Neko design with a clear belly and flower lei on clear. Back of bag is translucent red. Lucky Cat Twosie Zip Bags. 100 Food-Safe Bags with Zipper top.